Before you dive into your MTTC practice test and crack open your study guides, take a few minutes to read the information below. The history and development of the MTTC test will your develop a perspective that aids in getting a passing score. The Michigan Test for Teacher Certification (MTTC) is mandated by Michigan legislators in Section 1531 of the Public Act 451 (1976). The exam is designed to determine if someone seeking a career in education has the necessary knowledge and skills to serve Michigan schools, in their field of specialization, at an entry-level position. The majority of MTTC tests are offered in a paper-based format however some are available on computer. These include Basic Skills, elementary education, and mathematics (both elementary and secondary). It is important to register as early as possible as seating is limited and assigned on a first come, first serve basis. Those candidates seeking to write a paper based exams can register by mail, telephone or the internet, however registration for computer based exams must be done on the internet on the MTTC exam web site. The computer based MTTC examination varies in the time allotted depending on which subject is being covered and range from 1 hours and 30 minutes for a single Basic Skills segment such as reading, writing or mathematics to 4 hours and 30 minutes for all the Basic Skills subsets taken together. Paper based MTTC exams are available in morning and afternoon sessions. The morning session starts at 7:15 a.m. and finishes at 12:30 p.m. The afternoon session starts at 1:00 p.m. and finishes at 6:15 p.m. The amount of time allotted for the exam itself is 4 hours and 30 minutes. Once you register for the MTTC test you will be scheduled for either the morning or afternoon schedule depending on your test selection. If you register by mail you must include a completed registration form and a letter that details your request. The cost of the Basic Skills test is $48 and the cost of subject area exams is $73. Payments can be made using VISA or MasterCard, or a debit or check card that has a VISA or MasterCard logo and doesn’t require a pin number. Once you have registered and paid for your selection, you will receive an admissions ticket that will list the test date, test center and reporting time. When you arrive at the MTTC exam center, you will need a printed copy of your admissions ticket, several sharpened No. 2 pencils with erasers and identification. The identification must be current, and government issued that have a photograph and signature, such as a drivers licence or passport. If you arrive late, you may not be allowed to take the assessment. Those who are admitted late do not receive additional time at the end of the exam to compensate for the loss of time at the beginning. The MTTC test includes subject-area exams and a Basic Skills test. The subject-area exams are all multiple choice questions except for the world language tests which include both multiple choice and two or more constructed responses. The Basic Skills test contains multiple choice questions for reading, mathematics and a constructed response for the writing section. The number of MTTC multiple choice questions will vary depending on which exam is selected. The final score is dependent on how many questions were answered correctly. There are no deductions for questions answered incorrectly. The content of each exam is designed to assess the test objectives, which are divided into “subareas” that cover key components. Each of the “subareas” offers further descriptive information regarding the content of the test. The MTTC test results will be available on the published test dates. If you register on line you can ask that the scores be sent to you by e-mail. If you register by mail or phone, the score report will be sent to the address that you provided at the time of registration. The raw score information is converted to a scaled score that ranges from 100 to 300. In order to pass the MTTC you must receive a minimum score of 220. A numeric score is only available for those who did not pass. For those candidates that are successful and achieve 220 or better, their report will simply indicate “pass”. test-takers scores are compared to an established standard, rather than other candidates. If you fail MTTC testing, it is possible to retake it however there is a 90 day waiting period between attempts. If you are well prepared however, you will only need to take it once! There’s no denying you want to ace your Michigan teaching exam and so you can launch your bright future as an educator. After all, you’ve been dreaming about standing in front of your very own Michigan classroom for some time now. You’re not about to let that dream slip away because you’re not sure how to prioritize your use of your MTTC study guides. If you’re wondering where to start, you’re not alone. More potential teachers are attempting to figure out what they should focus on for their specific professional readiness examination. And as every teacher knows, taking that first step can be scary – but once you’ve done it, you’ll be well on your way towards a passing test score. If you’re still terrified that you don’t know what to study – and have your test date in few weeks or just a few short days – then you’re in luck. We’ve compiled an extensive breakdown that totally demystifies the entire test prep process. Just think of this article as a blueprint – one that details the exact steps you need to take to land in front of your very own Michigan classroom. When choosing a MTTC practice test make sure it covers the full breadth of the content in your specific exam. In this study resource, you’ll discover in-depth breakdowns of popular exams, including your required Basic Skills test. No matter which four subtests you plan on taking, you can find the exact content you need to know to make the most of your MTTC exam preparation. Before we begin breaking down your exam, it’s important to note that any percentages expressed within the article will denote how much of that section (or questions) will make up your total exam score. Whenever possible, we will also show the number of questions you can expect to see on a particular competency. Now that we’ve outlined what you can expect from this article, let’s begin by examining what you can expect to see on your MTTC Basic Skills exam. Basic Skills : The Basic Skills test is an exam that’s designed to assess your knowledge of reading, writing, and mathematics. The reading and mathematics section will contain 43 multiple-choice questions each, which will account for 80% of your total test score. The writing section will contain one essay, which will account for 20% of your test score. You need a minimum score of 220 out of a possible 300 in order to pass this exam. Geometry and reasoning; including solving problems involving geometric figures and applying reasoning skills. The writing section will test your ability to communicate in writing to a specific audience, with attention to appropriateness, unity and focus. All candidates will expect to write a 300 to 600-word essay, which will be scored based on effective communication for a stated purpose. Elementary Education : This exam contains 100 questions and will test you on six competencies. You will need a minimum score of 220 out of 300 in order to pass this exam. These competencies include the following: Language Arts (24%); Mathematics (20%); Social Studies (15%); Science (15%); The Arts (13%); Health and Physical Education (13%). Biology : This exam contains 100 questions and will cover five competencies. You will need a minimum score of 220 out of 300 in order to pass this exam. These competencies include the following: Foundations of Scientific Inquiry (19%); Cellular Function (15%); Hereditary and Evolutionary Changes (22%); Organization of Living Things (22%) and Ecological Systems (22%). Chemistry : This exam contains 100 questions and will cover four competencies. You will need a minimum score of 220 out of 300 in order to pass this exam. These competencies include the following: Reflecting on and Constructing Scientific Knowledge (25%); Using Inorganic Chemistry (32%); Using Physical Chemistry (27%); and Using Organic Chemistry and Biochemistry (16%). Earth/Space Science : This exam contains 100 questions and will cover five competencies. You will need a minimum score of 220 out of 300 in order to pass this exam. These competencies include the following: Foundations of Scientific Inquiry (20%); Physical and Historical Geology (20%); Oceanography and Freshwater Systems (20%); Meteorology (20%); Astronomy (20%). Physical Science : This test contains 100 questions and will test three vital competencies that are integral to becoming a certified Physical Science teacher in the state of Michigan. You should aim to get a minimum score of 220 out of 300 in order to pass this exam. The three competencies include the following: Foundations of Scientific Inquiry (20%); Concepts and Principles of Chemistry (40%); Concepts and Principles of Physics (40%). Physics : This test contains 100 questions and will test five vita competencies. You should expect to receive a minimum passing score of 220 out of 300. These competencies include the following: Foundations of Scientific Inquiry (12%); Mechanics (24%); Electricity and Magnesium (24%); Waves, Acoustics, and Optics (20%); Nature of Matter, Thermodynamics, and Modern Physics (20%). Mathematics (Elementary) : This test contains 100 questions and will cover four important competencies. You should expect to receive a minimum score of 220 out of 300 if you want to pass this exam. The four competencies you should brush up on will include the following: Mathematical Processes and Number Concepts (28%); Patterns, Algebraic Relationships, and Functions (28%); Measurement and Geometry (22%); Data Analysis, Statistics, Probability, and Discrete Mathematics (22%). This exam was also designed to test your ability to use calculators and computers, so be sure that you’re fully aware of the uses and applications of these technologies across a range of mathematical topics. Mathematics (Secondary) : This test contains 100 questions and will cover four vital competencies. If you wanted to become a certified math teacher in Michigan, you should expect to achieve a minimum passing score of 220 out of 300. The four competencies you will be tested on include: Mathematical Processes and Number Concepts (28%); Patterns, Algebraic Relationships, and Functions (28%); Measurement and Geometry (22%); Data Analysis, Statistics, Probability, and Discrete Mathematics (22%). This exam was also designed to test your ability to use calculators and computers, so be sure that you’re fully aware of the uses and applications of these technologies across a range of mathematical topics. Language Arts (Elementary) : This test contains 100 questions and will cover four important competencies. You should expect to receive a minimum score of 220 out of 300 if you want to pass this exam. The three competencies that you will need to review include: Meaning and Communication (28%); Literature, Genre, and Craft (36%); and Skills and Processes (36%). English : This test contains 100 questions and will cover four competencies. You will need a minimum score of 220 out of 300 in order to pass this exam. These competencies include the following: Meaning and Communication (20%); Literature and Understanding (26%); Genre and Craft of Language (30%); Skills and Processes (24%). Social Studies : This test contains 100 questions and will test five vital competencies that are critical to become a certified Social Studies teacher in the state of Michigan. These competencies include the following: Historical Perspective (20%); Geographic Perspective (20%); Civic Perspective (20%); Economic Perspective (20%); Inquiry and Public Discourse and Decision Making (20%). History : This test contains 100 questions and will cover four important competencies. You should expect to receive a minimum score of 220 out of 300 if you want to pass this exam. The competencies on this test include the following: U.S. History (14%); World History (18%); Connections Among Social Science Disciplines (34%); Social Science Perspectives and Skill (34%). Sociology : This test contains 100 questions and will test five vital competencies that are critical to become a certified Sociology teacher in the state of Michigan. These competencies include the following: Foundations: Prerequisite Concepts and Skills (20%); Individuals, Groups, and Social interaction (20%); Social Organization (16%); Social Stratification and Change (20%); U.S. Social Problems (24%). Political Science : This test contains 100 questions and will test four vital competencies that are integral to becoming a certified Political Science teacher in the state of Michigan. You should aim to get a minimum score of 220 out of 300 in order to pass this exam. The four competencies include the following: Foundations of Political Science (25%); U.S. Government (35%); History, Economics, and Geopgraphy (20%); and Social Science Perspectives and Skills (20%). Marketing Education : This test contains 100 questions and will cover four important competencies. You should expect to receive a minimum score of 220 out of 300 if you want to pass this exam. The three competencies you should brush up on will include the following: Marketing Foundations (40%); Marketing Functions (40%); Technology, Ethics, and Career Development (20%). Visual Arts Education : This test contains 100 questions and will cover four vital competencies that you’ll be expected to know. You should achieve a minimum score of 220 out of 300 in order to pass this test. These competencies include the following: Creating Visual Art (33%); Aesthetic Knowledge and Critical Analysis of Art (25%); Art in Historical and Cultural Context (25%); Art Education (17%). Music Education : This test contains 100 questions and will cover five vital competencies. If you wanted to become a certified music teacher in Michigan, you should expect to achieve a minimum passing score of 220 out of 300. The five competencies you will be tested on include: Listening Skills (25%); Music Theory (16%); Music History (16%); Music Creation and Performance (16%); Music Education (25%). Physical Education : This test contains 100 questions and will test six vital competencies that are integral to becoming a certified Physical Education teacher in the state of Michigan. You should aim to get a minimum score of 220 out of 300 in order to pass this exam. The six competencies include the following: Physical Activity, Fitness, and Health (17%); Movement and Lifelong Physical Activities (27%); Growth, Development, and Learning (14%); Planning, Instruction, and Assessment (14%); Management, Motivation, and Communication (14%); Foundations, Reflection, and Professional Collaboration (14%). Spanish : This test contains 100 questions and will test six vital competencies that are critical to become a certified Spanish teacher in the state of Michigan. These competencies include the following: Listening Comprehension (15%); Reading Comprehension (15%); Language Structures and Comparisons (15%); Cultural Understanding, Comparisons, and Connections (15%); Language Acquisition, Instruction, and Assessment (20%); and Writing (20%). Technology and Design : This test contains 100 questions and will test four vital competencies that are critical to become a certified Technology and Design teacher in the state of Michigan. These competencies include the following: Concepts and Applications of Technology (39%); Physical Technology (23%); Information Technology (23%); Bio-Related Technology (15%). Visual Arts Education : This test contains 100 questions and will cover four vital competencies that you’ll be expected to know. You should achieve a minimum score of 220 out of 300 in order to pass this test. These competencies include the following: Creating Visual Art (33%); Aesthetic Knowledge and Critical Analysis of Art (25%); Art in Historical and Cultural Context (25%); Art Education (17%). To find out more about your specific exam, visit the official Michigan Test For Teacher Certification website. Now that you have the breakdowns you need to succeed, it’s time to crack open your MTTC practice book and start working on that Michigan teacher certification! "Why Not Pass The MTTC Now And Tell Your Own Success Story?" It actually covers the real MTTC! FREE MTTC practice questions (just like the exam). By MI licensed teachers who passed. 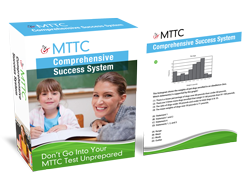 Get FREE MTTC Study Guide Now!